These programs attempt to reduce card-not-present fraud by introducing an identity check after a “confirm purchase” button and before the confirmation page. When a merchant accepts a payment where the cardholder is not present at the merchant’s physical location — i.e., by phone or over the Internet — then traditionally the merchant accepts liability for any disputed charges due to fraud or cardholders denying that they made the purchase. The introduction of the 3D Secure — here’s the Wikipedia definition — shifted the liability for chargebacks to the credit card company, which is a significant benefit for the merchant. Merchants therefore often include these additional security steps to avoid being charged higher rates for processing credit cards and to reduce chargebacks. 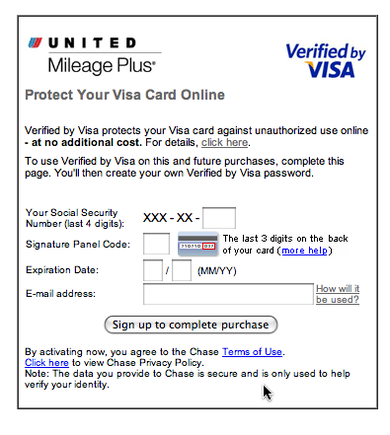 Verified by Visa pop-up on United.com. When these programs were first introduced, many merchants saw significant negative impact on conversion rates in the payment process. Shoppers were spooked by an extra step, where a pop-up required they set up an additional password, and then remember it. This caused shoppers to abandon at the last step in the checkout process, and encouraged some merchants to offer PayPal as an alternative. However, as consumers have become more accustomed to these pop-up boxes asking them for additional passwords, abandonment rates have declined to under 10 percent for most merchants. But I’ve recently noticed a new trend: merchants are starting to use the Verified by Visa and MasterCard SecureCode logos as “security seals.” You can see an example of this on the Zales.com cart summary page below. Zales.com cart summary page, with Verified by Visa and MasterCard SecureCode logos in lower left. I’ve long believed that this is a bad thing for conversion rates — whether it helps prevent fraud is another matter — but until now it was just a intuitive feeling based on anecdotal evidence and a personal dislike of the 3D Secure program. I’ve frequently abandoned when I’ve encountered one of these pop ups. My company, SeeWhy, set out to learn if this logo use was a deterrent to others as well. In a survey of 502 U.S. online shoppers to determine consumer attitudes to these programs, SeeWhy asked them whether they would consider abandoning when presented with one of these logos. It may not sound like much if 10-to-12 percent abandon upon seeing one of these logos. But remember that these logos are being shown on the cart summary page or at the start of the checkout. Therefore, the potential impact is much greater because there is significantly more traffic at this stage compared with the end of the checkout process, when the pop-up is presented. If PayPal is being offered as an alternative this may cause more customers to use PayPal, incurring potentially higher levels of fees for the merchant. This study only looked at whether these logos would cause shoppers to consider abandoning. It is not definite evidence that customers will actually abandon. Moreover, the study doesn’t attempt to review the overall financial impact of an increased abandon rate versus a lowered fraud cost. Presumably Visa, MasterCard, and American Express have similar interests as merchants, in that they receive processing revenue only when a transaction is complete. But, nonetheless, the study could be sufficient to give pause to using these logos as security seals. Here are three strategies you can take to minimize abandonment. Don’t use 3D Secure logos. These logos point out that there is an additional security step in the shopping process. If visitors are concerned that they may not be able to remember their password, or (like me) just don’t like the annoying pop up program, then they will abandon. Today 10-to-12 percent will abandon, but as more visitors become familiar with these logos and the programs they represent, we can expect abandonment rates to increase. Use the credit card logos instead to indicate the payment choices available. Bypass 3D Secure for loyal and frequent customers. If your site can detect high-value or frequent customers when they log in, then use this rule to skip the additional security pop up. A few airlines have started doing this for their most frequent fliers. It makes no sense to make it harder for your most frequent customers to buy from you. These customers are very unlikely to try and chargeback transactions. Offer payment choices, and the ability to switch. If you have an abandonment problem caused by 3D Secure programs, then you should consider offering alternatives, such as PayPal and Google Wallet. Both of these payment methods avoid the 3D Secure requirement and are particularly effective for mobile transactions where additional steps in the checkout process cause abandonment on a massive scale. By contrast, mobile wallets convert at significantly higher rates on mobile devices compared with credit cards. An A/B test comparing payment card logos with 3D Secure logos would be the most scientific approach. If you have run this kind of test, please share the results here so that we can all learn.